Southern Fried L'Attitudes: Freezer Delivered and Christmas is Wearing Me Out! Freezer Delivered and Christmas is Wearing Me Out! The freezer has been delivered to Katy and Cody, thanks to Granny's van! They guys got her unpacked from the box and put her in place and plugged her up. They held off getting the deer meat picked up one more day so the freezer would be ready to go. They are happy to have it as they had no where to put the deer meat so it's "just in time". They can now go and stock up on "sale meat" also when they go shopping. We sure have enjoyed ours which is that size. Ours is full right now and that is a good problem to have. We will be eating it down until about spring and will go and fill her up again with the bargains. We pretty much have to turn down the bargains right now unless it's a steal as our own freezer is full. We do have a another fridge/freezer downstairs if needed though. After dropping the freezer off we went to Granite City for dinner in Franklin/Cool Springs area. Oh their food is sooooooo good! I got a salad and french onion soup. I wanted soup so bad yesterday for lunch but all the restaurants around work were hopping with holiday lunch parties or either lots of tourists in the area- you could tell by the parking lot. So I ate quickly at McDonald's. This soup was really good! Well, the nights have really been busy this week. I was so tired on the way home that I kept falling asleep. Good thing I wasn't driving. But I got up about 3 yesterday I think. Or was that the day before? I can't remember. I am getting off of work today and we are going to the store. I think I'm making a chocolate silk pie for Columbia and then getting stuff for our Christmas Eve meal here. And then probably a few things for Christmas Day - strange enough we really haven't discussed Christmas day much. I just haven't been able to get that far with so much going on but I guess the time has come. We will have another grocery opportunity to go out and get stuff for that - so we'll see. Christmas wears me out. But it's ok. Rest is coming soon. I think Christmas pretty much wears us all out. But it's a good kind of tired to be for sure. 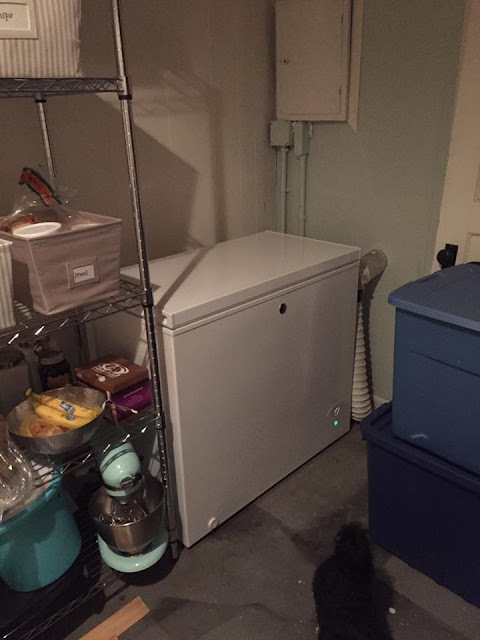 A freezer is something I often wish I had. A small one like that could possibly even fit in here in my small house. Being able to stock up when things are on sale makes for some great savings. Hope what ever you decide to do, that you have a very Merry Christmas and enjoy the time off. The freezer looks nice. looks like they found a good spot for it. Perfect for all that meat.